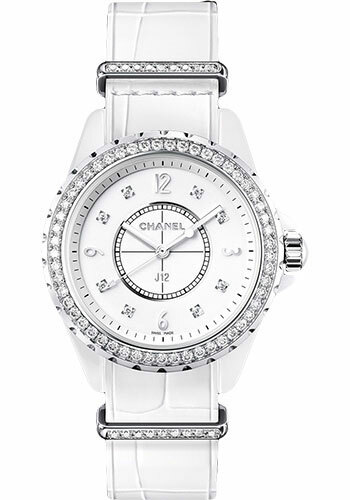 33 mm white ceramic case, non screw-down crown, steel bezel with 53 diamonds, white dial with 8 diamond indicators, quartz movement with hours, minutes, seconds, white alligator strap, steel ardillon buckle. Water resistant to 50 meters. 33 mm 18K white gold case with white high-tech ceramic, 18K white gold bezel with 34K baguette-cut diamonds, white dial with 12 baguette-cut diamond indicators - 0.26K, quartz movement with hours, minutes, seconds, white alligator strap, ardillon buckle with 9 baguette-cut diamonds - 0.60K. Water resistant to 50 meters.